Be the prize of your city! The envy of all your friends and enemies! Reading is an integral part of the world we live in, but most people crawl along reading at the pace a snail moves. Speed Reader Enhanced is a free way to speed up your reading. 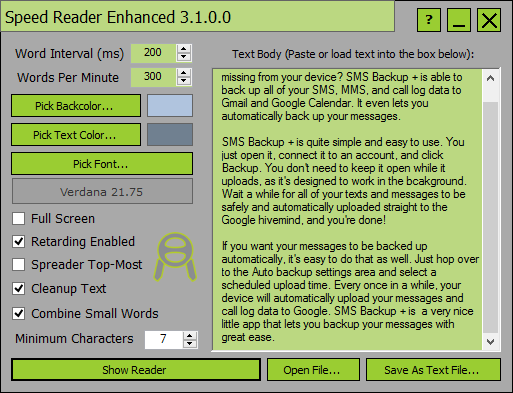 Speed Reader Enhanced is easy enough to use, although its lime green skin won’t win any beauty contests. Paste a block of text into the right text box: this description would work, for instance, or the latest New York Times headline. Then select your speed in the top left hand corner. You can try it on the default speed as-is, and adjust it as needed later. Then press Show Reader. A light blue window will pop up with a message telling you to press a key. If you press any random key on your keyboard, the text will start: you’re off! In just a few minutes, you’ll have gotten through any reasonably sized block of text. You’ll notice that after a while, you tend to pick up more and more of what you’ve read. In short, Speed Reader Enhanced is a nice, free program for speeding up your reading skills. It’s however silly to use a program to do something that a webapp can do just as well. In cases where you’re not the sole owner of the computer, I’d definitely recommend you use a webapp like Spreeder  instead, as it has a neutral color scheme and requires no extra downloads. Are you looking for a way to compress your boring old long URLs into potentially dozens of shortened URLs? MURLS is your friend. Capable of shortening URLs using almost 3 dozen shorteners, MURLS is an entirely free and open source app that steps over the bounds from use to uselessness. There are tons of reasons to shorten URLs, such as QR codes, but in all of those cases, you’d rather have just one URL. Creating multiple URLs is more of an exercise in programming ability: can you create a program that sends a large number of requests and receives a large number back? However, if you find yourself needing to disguise a link in multiple places in ways that humans can not see, MURLS may give you the multitude of URLs you’re looking for. It’s free, and is entirely open source. There’s something addictive about Reddit, the online link and media sharing site. There’s oodles of doodles of cats and food, and there’s nothing you can do to stop yourself from looking. Reddimage, rather than helping that cause, makes it worse: now, you can get Reddit’s photos directly in a beautiful Metro not-Metro app. As you can see to the right, I’ve scrolled over to the intersection of /r/aww and /r/food. This is the perfect combination of cute cat photos (the Internet’s #1 export) and food (the Internet’s #1 import). If you log in, you can select your favorite subreddits on Reddit.com and have only them show up in Reddimage. Overall, if you’re running Windows 8, you absolutely must download Reddimage. If it had the ability to generate tiles from non-image content, it’d be perfect, but even limited as it now is to images only it’s still quite nice. It also lacks the ability to place animated GIFs, which is odd, as approximately 127% of Reddit is composed of these life forms. It’s still a great Reddit client for anyone who’s looking for a way to view images on their brand-new Windows 8 laptop or tablet. 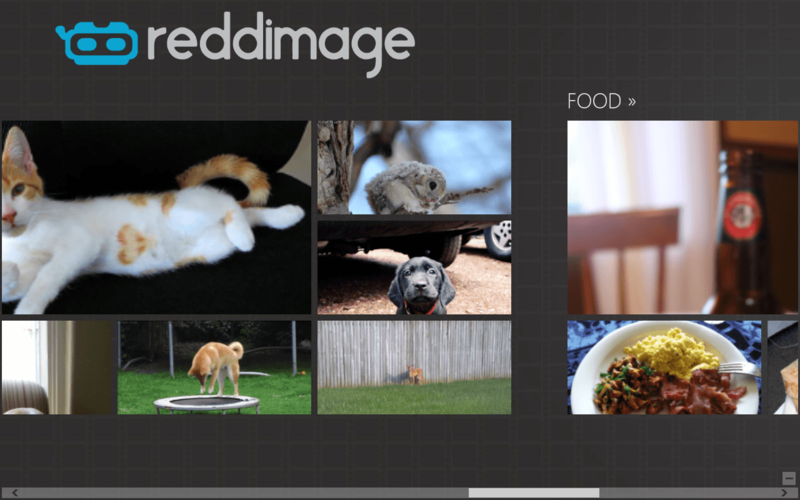 Reddimage on Windows Store [!] — unknown link. Use search.